Poultry and pig producers manage water quality in different ways. In the field, waterline cleaning protocols seem more frequent on poultry farms than on pig farms. In order to update data concerning the different perceptions and practices for water management on pig and poultry farms, a study has been conducted to compare water supplies, their optimisation and the different management practices for piglets in post weaning rooms and broiler chickens. A survey was carried out on pig and poultry farms located in the West region of France. Twenty-five pig producers and 25 poultry farmers have been selected. A questionnaire was completed during an interview with farmers. The association between practices and the characteristics of the production has been analysed with Khi-deux tests. 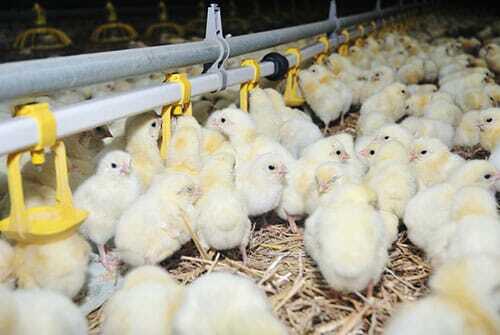 Water mainly comes from drilling (50 per cent for both chickens and pigs). Sixty per cent of pig farmers use continuous water disinfection (chlorination) whereas 80 per cent of poultry farmers perform it with different disinfectants (the remaining 20 per cent use tap water). Regarding sanitary status of animals, some recurrent diseases can be linked to unadapted water quality. Digestive disorders during the post-weaning period (82 per cent) and lameness of birds (90 per cent) are the most frequent disorders. No pig farmers drain water lines while 72 per cent of poultry farmers do. During the down period, all the poultry farmers set up protocols with mechanical and chemical procedures: 44 per cent use flushing, draining, base, acid and disinfectant whereas 24 out of 25 pig farmers only clean the troughs in post-weaning rooms. This study underlined that the control of water management is more settled in poultry farming compared to pig industry. These different treatments and maintenance practices could help to prevent digestive disorders in weaners and thus to reduce antibiotic consumption.